"Heavenly Father has a plan for me. It is kind of like a treasure map. First we are born, learn to be happy, read our scriptures, say our prayers, go on a mission, get married, return to Heavenly Father's house, then we get our treasure." I love Primary and simple talks that ring true. After a little prompting and recovering from a case of stage fright, Max delivered his talk nearly perfect. Good Job Max! Good Job Max! Looks like a cute talk. P.S. I love the guest book, so fun! Holy hannah! Max repeated that talk almost perfectly to me tonight while I was babysitting (after the good games and before Jacq peed on me). The only step he forgot was the mission. I asked if I could have a treasure and he went through the steps...but I was stopped at get married. Blast. Adorable. As primary president I LIVE for talks like these! Smart kid. Good parents. What a cute talk! I love the picture! Way to go Max! Max is so smart! He has it down to a science! I love it. Way to go Max! We loved your talk. 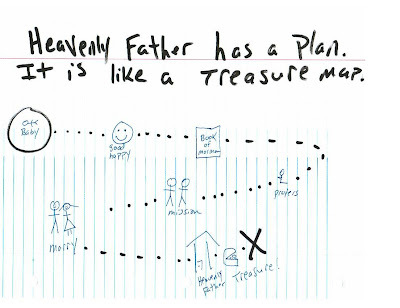 Ethan said he loves the part about Heavenly Father's Treasure! Way to go Max, I love your talk, Ell athought it was so cool! She said she wants you to teach her how to do talks in primary! Thats what big cousins are for right?! I am serving in the primary right now and I completely agree. I love to hear the talks, especially the ones that the kids write themselves. P.S> I don't blame you for not taking your kids to Disneyland yet. YOu kindof have your hands full!! That is so cute! Way to go Max!